MC-dependent recruitment and activation of T cells in the skin during DENV infection. MC-deficient (Sash) and MC-sufficient (WT) mice were injected with saline or infected with 1 × 105 pfu DENV by s.c. injection into the FP to determine whether T cells were recruited in a MC-dependent fashion during infection. FP skin was collected on days 1, 3, and 5 after infection and dissociated with collagenase to make single-cell suspensions, which were stained for various subsets of T cells prior to flow cytometric analysis (Supplemental Figure 1). Numbers of (A) total T cells (CD3+), (B) NKT cells (CD3+NK1.1+), (C) γδ T cells (CD3+γδ TCR+), (D) CD8+ T cells (CD3+CD8+), and (E) CD4+ T cells (CD3+CD4+) were compared between WT and Sash mice. Sash mice reconstituted with BMMCs (Sash-R) were similarly infected, and FP skin cells were stained on day 3 after infection. Reconstitution of MCs in Sash mice restored the deficiency in T cell numbers (Supplemental Figure 2, A–E). 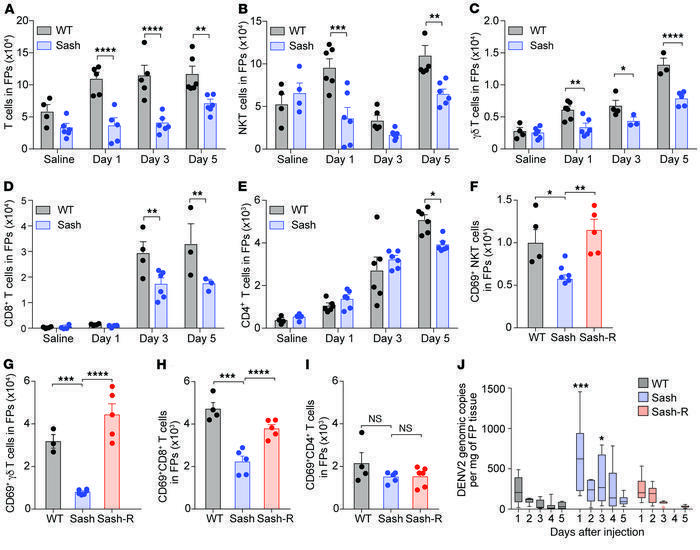 In multiple T cell subsets, (F) NKT cells, (G) γδ T cells, and (H) CD8+ T cells, (I) but not CD4+ T cells, there were greater numbers of activated (CD69+) T cells in the FPs of WT mice compared with those of Sash mice on day 3 after infection, and the deficiency in activation was repaired in Sash-R mice. (J) A larger number of genomic copies of DENV were detected in the FPs of Sash mice compared with those of WT and Sash-R mice, as determined by RT-PCR. The means are depicted by box and whisker plots with Tukey’s test error bars. An alternate presentation of the data from J showing individual mouse values is provided in Supplemental Figure 2F. For all panels, unless otherwise noted, data represent the mean ± SEM. *P < 0.05, **P < 0.001, ***P < 0.001, and ****P < 0.0001, by 2-way ANOVA with Sidak’s multiple comparisons test. n = 4–6 mice. Reduced recruitment and activation of several subsets of T cells occurred in the skin of MC-deficient mice during DENV infection, which was repaired upon reconstitution of MC-deficient mice with MCs.